The Visitor Center, near the front gate of Shaw Nature Reserve, offers books and merchandise for sale and classes often start from here. One of the original buildings on the site, the Bascom House built in 1879, was restored in 1993. Two sturdy, rustic pavilions were installed in early 2011. Sunny’s Pavilion and Myron’s Pavilion are a shelter and staging area for educational programs and events. The pavilions are located near the Bascom house and wildflower garden. Next to the pavilions are accessible restroom that are always open with a green roof. An excellent place to stop and eat lunch while you are at Shaw Nature Reserve. The Trail House is centrally located among the Reserve's 17 miles of trails. The Trail House provides picnic tables, restrooms, drinking water, and also has a parking lot close by. Accessible parking is located on the east side of the Trail House. The sod house was built in 2004 and is located along Brush Creek Trail just north of the Trail House. Stop by the sod house for a cool break on a hot summer day or warm up in here during the winter. 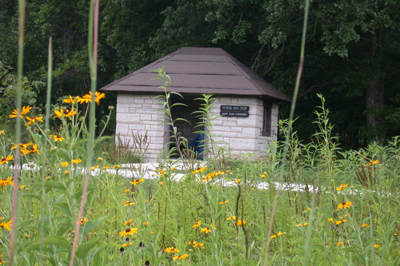 Located near the wetland, the bus stop provides shelter and a water fountain during a hike. There is a parking lot across from the bus stop. 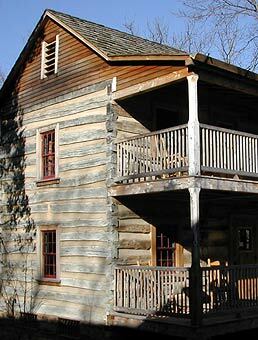 This set of reconstructed 1800's buildings is used for education programs and events and can be rented by groups. To visit these buildings you must make a reservation. The Dana Brown Overnight Center is an overnight facility for those who would like to experience Shaw Nature Reserve after dark. 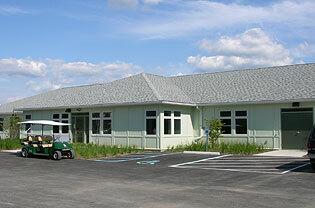 The support facility at Shaw Nature Reserve, the Edgar Anderson Center, was constructed in honor of Dr. Edgar Anderson and was dedicated on June 29, 2010. This building houses the Seed Bank, offices, and is only open to the public during certain classes. The Edgar Anderson Center earned LEED™ gold certification. Opened in April 2015, all areas were constructed from natural and/or repurposed materials. The trail house, built in 1942 with native rock, is a central point on Shaw Nature Reserve's 14-mile trail system. The starting point of the river trail system, trails departing here lead visitors through glades, prairie, woodlands, bottomland forests, and provide access to the Meramec River. Restrooms, drinking water, and a sheltered picnic area are available. The Trail House, #8 on your map, is accessible by car using the Trail House Loop Road Monday through Thursday during the months of April through October from 8:30 am to 4 pm. The first stop on the Wilderness Wagon Tour, the Trail House is located near the Crescent Knoll Overlook and the Sod House. To reach the Bascom House take the Pinetum Loop Road to #4 on your trail map. 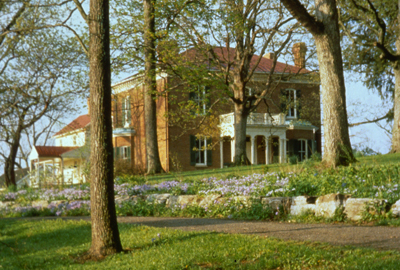 The Bascom House is open to the public from 10 a.m. to 4 p.m. Monday through Sunday. One of the original buildings on the site, the Bascom House, built in 1879, was restored in 1996. Close by the Bascom House are the Whitmire Wildflower Garden and Pinetum Lake. This sod house was completed in the fall of 2004 with lots of help from Shaw Nature Reserve staff and volunteers. The sod house is located along Brush Creek Trail in the prairie north of the Trail House parking lot. 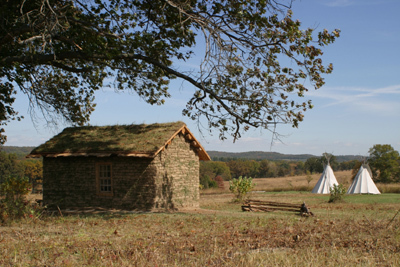 When pioneers decided to make their home on the prairie there were no trees or rocks to build with so they made sod bricks to build their house. The sod walls must be very thick to support the weight of the sod roof. A benefit of thick sod walls is that the house stays cooler in the summer and warmer in the winter due to the added insulation. While you are hiking at Shaw Nature Reserve take a break in the sod house and feel the refreshing difference in the temperature. Near the sod house are the teepees, which are only up for special events during the fall. Built in 1939 by the Civilian Conservation Corps, this rustic stone structure was designed by the National Parks Service and moved to Shaw Nature Reserve in 2002. A welcome respite and water fountain for guests hiking the prairie and wetland trails. The Gardenway Bus Stop parkinglot, #14 on your map, can be accessed from the Trail House Loop Road. The second stop on theWilderness Wagon Tour is the Gardenway Bus Stop. Near the bus stop is the Wetland Complex, prairie observation deck, Roberts cemetery, and the serpentine wall.